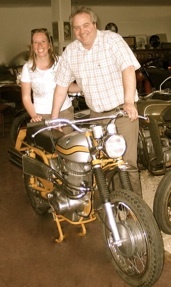 For many decades we have specialized in offering veteran and vintage motorcycles of all makes and we hope we can help you make the right choice. Our constant stock of more than 20 machines is changing constantly, which makes it worth while to check in often with us. We offer a choice between solo machines as well as sidecar-combinations in both civilian and military versions. Also we can try to find the bike you are looking for through our broad network of contacts we have build up over the years. We don’t repair or restore motorcycles for ourselves or others.The bikes we offer are sold in the same condition we find them. We are happy to give you a full description of the machine you are interested in,including picture. If we know of something wrong with the machine you are interested in we’ll tell you. Furthermore you are also very welcome to visit our showroom here in Peer, Belgium, by appointment. Please contact us first. Finally, something also important, we can supply you with Many references of satisfied customers all over the world.